Never have enough time during the week to make a healthy lunch? Are you looking for a solution but feel overwhelmed by all the food prep posts on social media? Well, I am here to tell you it doesn’t have to be difficult and time consuming! 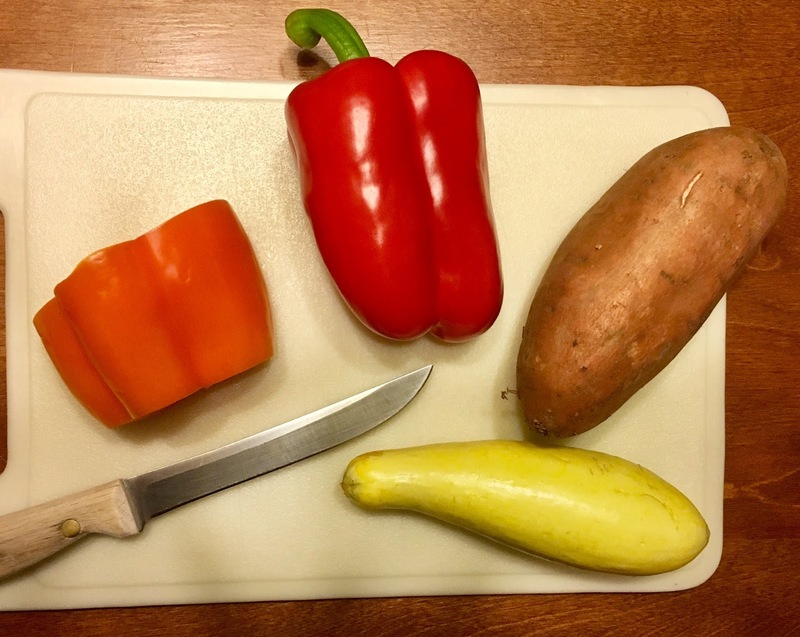 This post will help you get started on your meal prepping path. It’s as easy as 1-2-3! This week, I am working once again with my fabulous mother and prepping these, Roasted Vegetable Whole Grain Bowls. In the end, we made 5 meals for my mom to take to work with her. 1. Start with a Whole Grain Base. 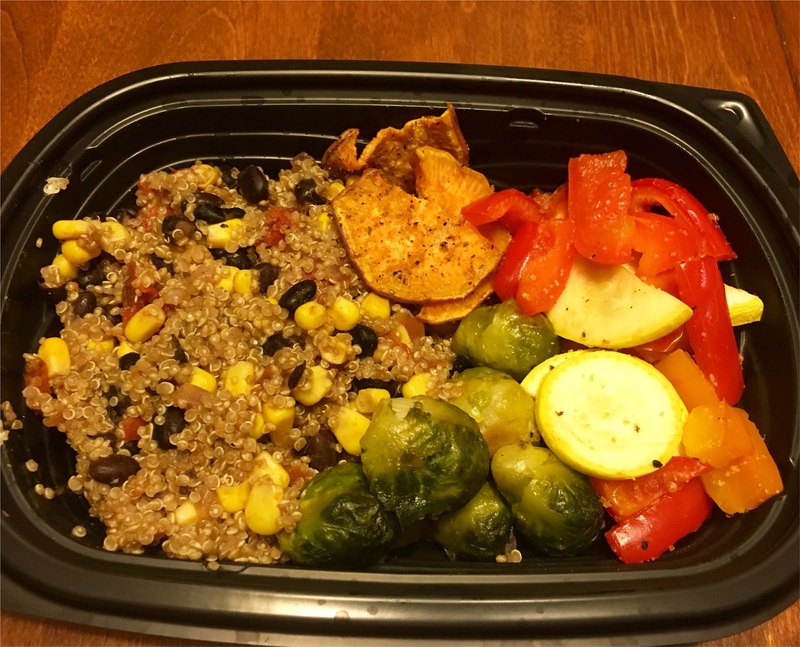 For this bowl, we are using my Spicy Cowboy Quinoa as our base, but you can use any whole grain you want. Did you know eating more whole grains may help you live longer?! Individuals who eat more whole grains have a lower risk of dying from heart disease and cancer (Zhang B et al, 2017). Experiment with a variety of grains, such as brown rice, farro, quinoa, amaranth, and barley, to see which you like best! Try exploring local farmer’s market and ethnic food shops to discover new types of grains! 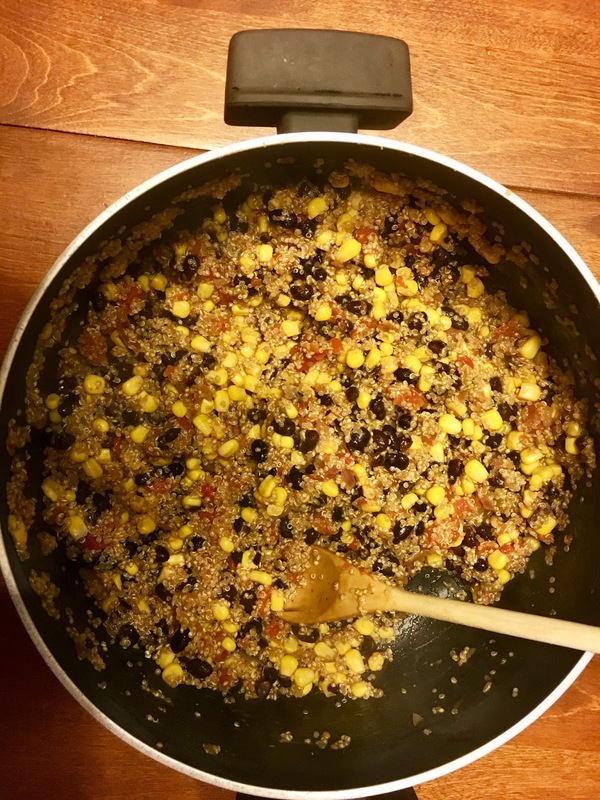 Add canned vegetables, such as tomatoes, corn, peas or beans to the grains for added flavor. 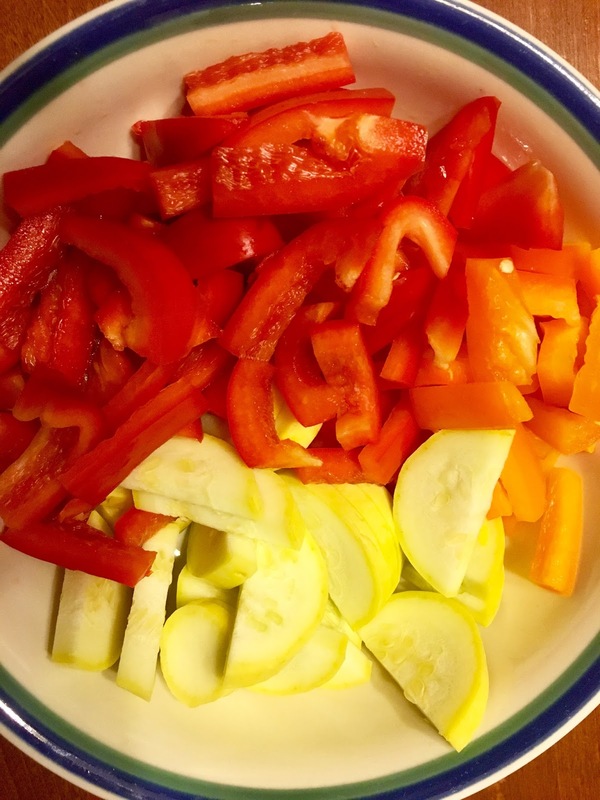 This is also an easy way to get a few more veggies in, especially for those picky eaters! Cooking grains in low-sodium vegetable or chicken stock is another way to add flavor. You can buy stock at the store or make it yourself. If you have high blood pressure, check the sodium content on the nutrition label of any store bought stocks and pick the one with the least amount. You can use half water and half stock to reduce the sodium and add flavor. Vegetables seem to be the hardest food group to get people to eat. 87% of Americans do not meet daily recommendations for vegetable intake (Moore & Thompson, 2015). 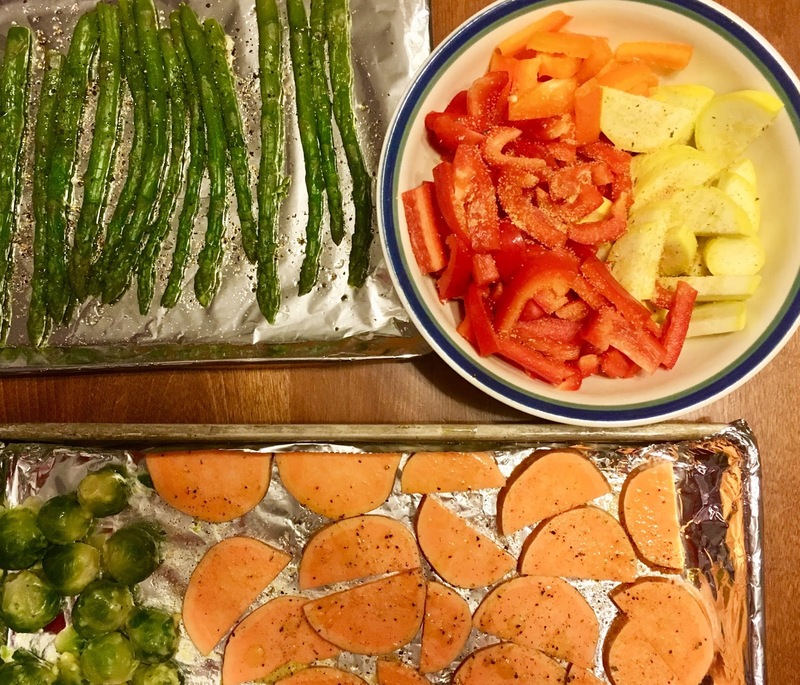 For those who tend to pass on the veggies, roasting them is a great method to add flavor without adding excessive calories! frozen brussel sprouts, and they turned out well! The brussel sprouts came in a steamer bag so I microwaved them for a few minutes before roasting. Once chopped, toss vegetables in a couple teaspoons of olive oil. Feel free to try other oils as well, like sesame oil for an Asian inspired bowl! Next, season with a little black pepper, garlic powder, and paprika. Sometimes I go crazy with the spices in my cabinet, throwing in a random assortment! Last, spread veggies on a baking sheet and throw in the oven for 15-25 minutes until slightly browned and softened to desire. Tip: Sprinkling a pinch of sugar over the vegetables will help them brown in the oven! This last step is optional. Tonight we didn’t use any additional protein. If you choose, top off your bowl with a lean protein, such as grilled chicken, fish, shrimp, or tofu over other types of meats. More and more research is suggesting that certain types of red and processed meats may be linked to colon cancer (Carr et al, 2016). Additionally, animal meat, especially red and processed meats, are high in saturated fats and cholesterol. This does not mean you should never eat meat, but try to limit the amount of animal products you consume each day by eating at least one meatless meal (if not more!). 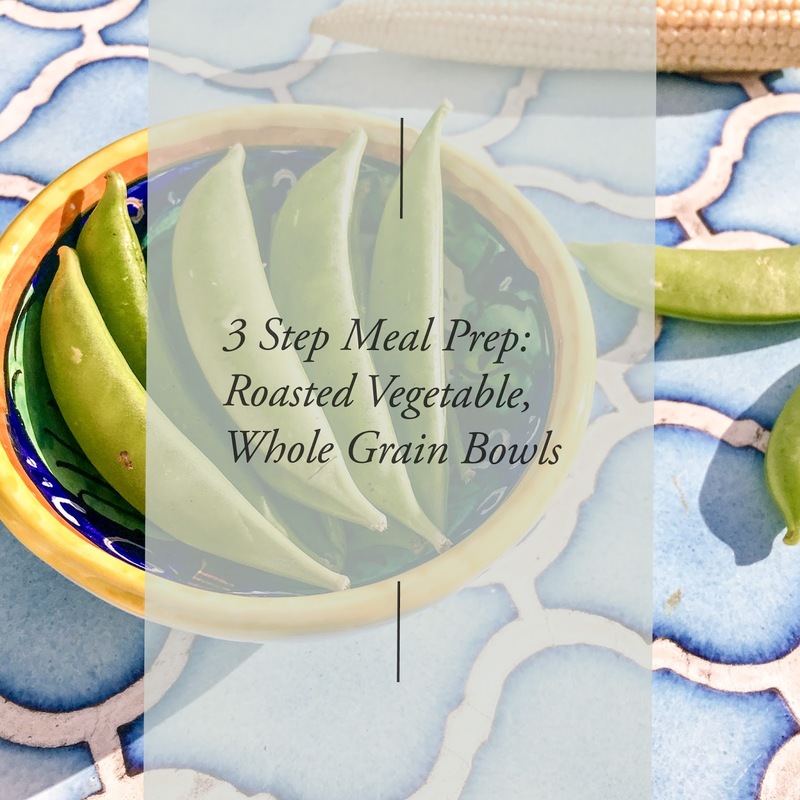 When adding a protein to your grain bowl, prepare using a method that adds little fat and calories, such as baking or grilling, or preparing on the stove top with less than 2 tsp oil or butter per serving. One of my favorite easy ways to marinate boneless, skinless chicken breast is with a light Italian dressing. Then bake in the over at 350 degrees for 15-20 minutes. Meal Prepped! Just add meat if you like! Once all your parts are prepped, set out reusable containers. Add 1-1.5 cups of your whole grain (Hint! this is about the size of your fist! ), 2 cups roasted vegetables (two fists! ), and 3-4 oz of protein (the size of a deck of cards!). Pre-portioned containers can be stored in the fridge for 5-7 days or in the freezer for up to a month! Tip! Try adding a low calorie, low sodium salad dressing! I like to make my own dressings that are usually some type of oil,vinegar mix. Or, try replacing some of the grains with greens for a lower carb version! As always, thanks for visiting IslandRDN! Come back again soon for more updates!